Very nice lots of potential for Timetable Operating. When the first post about the Willow came up I was going to mention it. Had one in my last Garden, but a baby compared to yours. Got so fed up of the Leaves on the Line that one day the Chain Saw came out. No more Willow, never regretted it except for the nice cooling effect on a very hot day when sat beneath it. But those leaves, seamed to be falling off the thing all year. It did make Running the line a bit of a trial having to clear them before every running session. Truth be told I bet you do not miss your one now that it has gone. Well I posted this before continuing along your thread. Truly a magnificent railway ! This is very impressive and it must be really satisfying to see it develop. 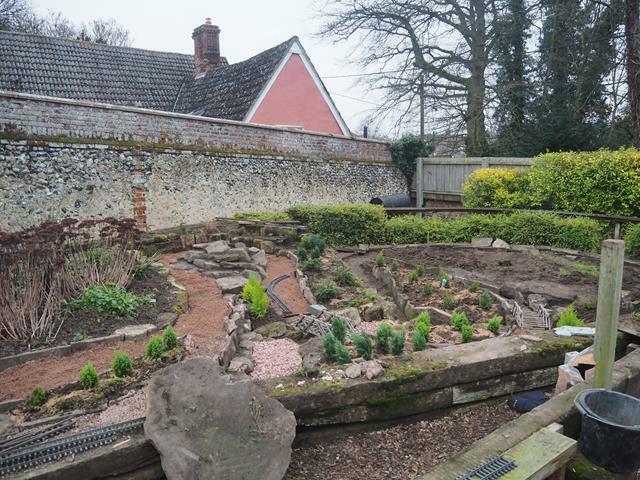 I'm also admiring the lovely old flint? 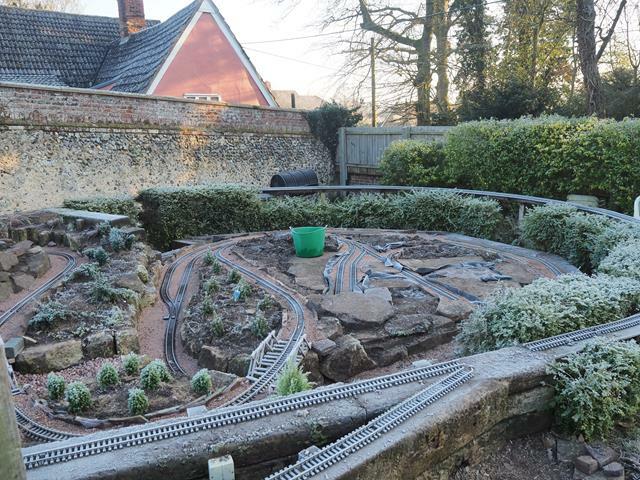 wall that makes such an attractive backdrop to the layout. I too have a few box trees. 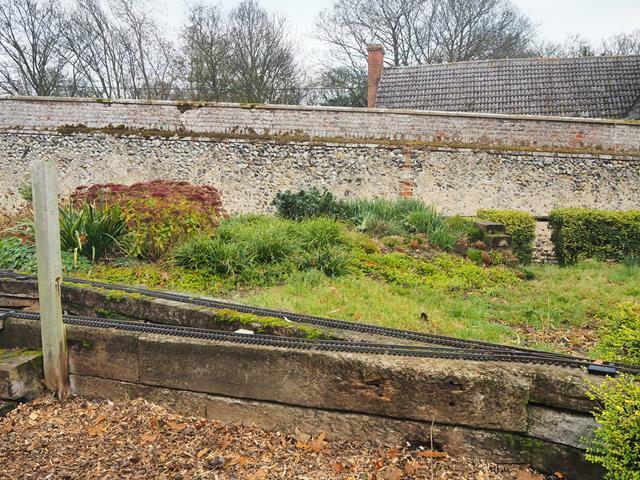 Those in the front garden have already been attacked by box moth caterpillars but those on the layout in the back garden are unaffected so far. With retirement looming and no weeping willow it was time for a little creative expansion. This was much aided by attending a local auction at which the remains of a huge LGB layout in a now defunct shop were being disposed of. Prices at these auctions have gone up with the advent of bidders on line but that only works if you can put the item in the post. Does not apply to huge boxes of used flexible LGB track.. 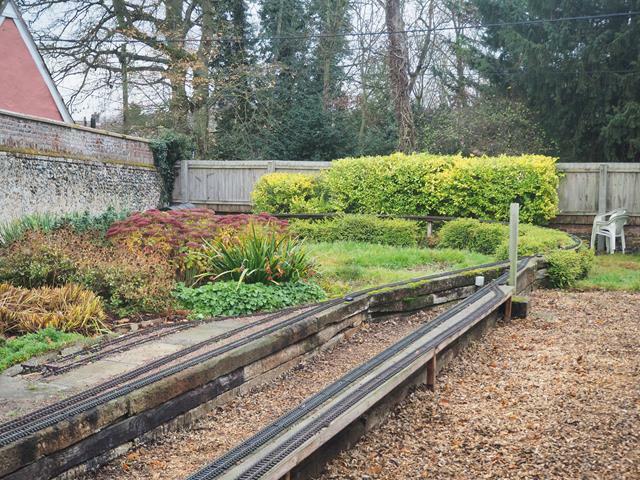 I only bought two of the 6 available, but they weighed about 40 kg each and I ended up with about 70-80meters of track for £250. 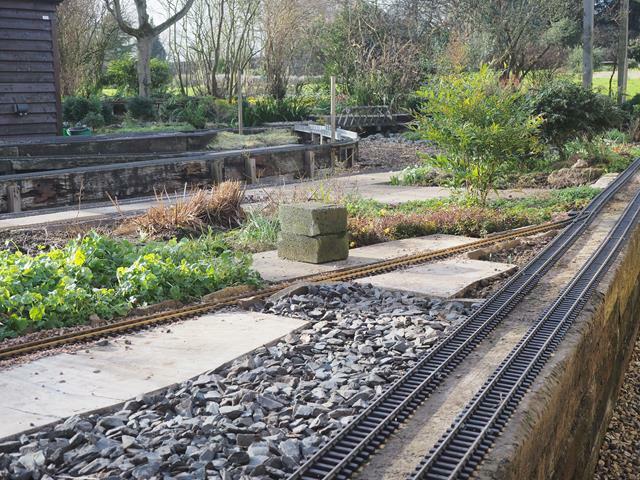 The stuff us garden railroaders have dreams about. OK some of it was pre-bent but could be straitened, and some of the rails had gouges where I suspect the track cleaner had stalled with it abrasive wheels running. Something I recognise from my own experience. But most of it was fine if a bit grubby. This combined with the space left by the willow tree was an opportunity not to pass up. 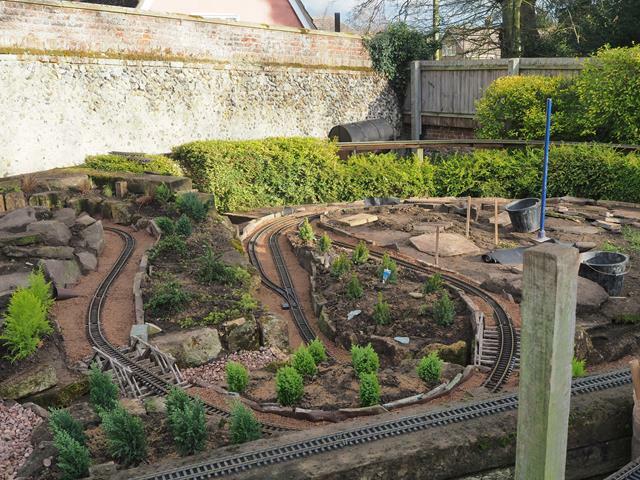 the biggest problem was the drop of about 55cm from the track level down to the tree stump level. 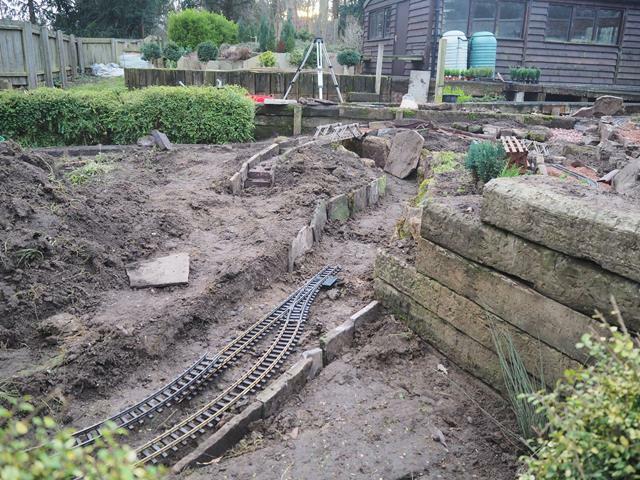 this was down this slope which does not show very well but the sleepers give you some idea of the drop involved. I wanted to keep the gradient down to a maximum of 1:25. Happy for it to be steeper than the main line as I envisage this as a branch logging line with tighter curves and gradients, running shorter trains. another view of the slope down which trains had to run. 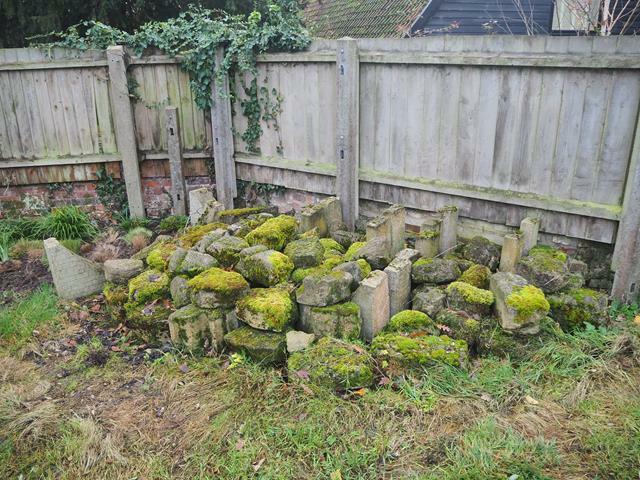 for materials I had 2 rockeries elsewhere on the line which I was going to take apart and this pile of stone I picked up some years before in a car boot sale. 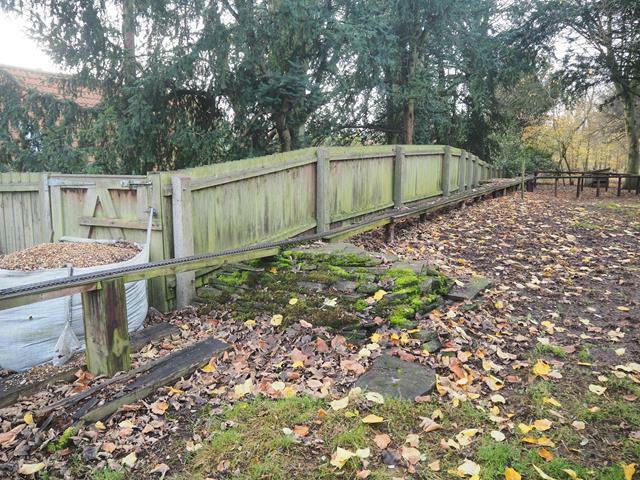 Also visible are the upturned ends of some cast concrete bridges I made for my very first railway but have not used since. They are very heavy and have now moved house twice! 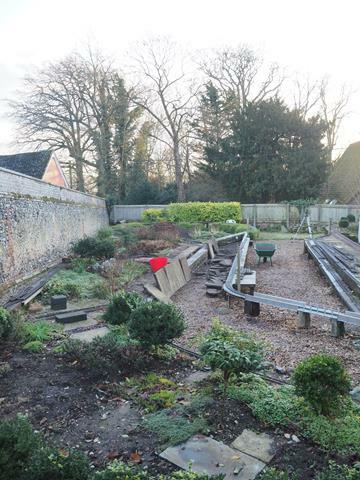 Work commences with plant clearance, most of these were moved to a vacant area of flowerbed hastily created away from the trains. and as always the biggest challenge is bot creating a track plan that allows for realistic operations and then actually making it fit in the space, particularly where there are points which always seem to me to be very inflexible just when you want to fudge things a bit. 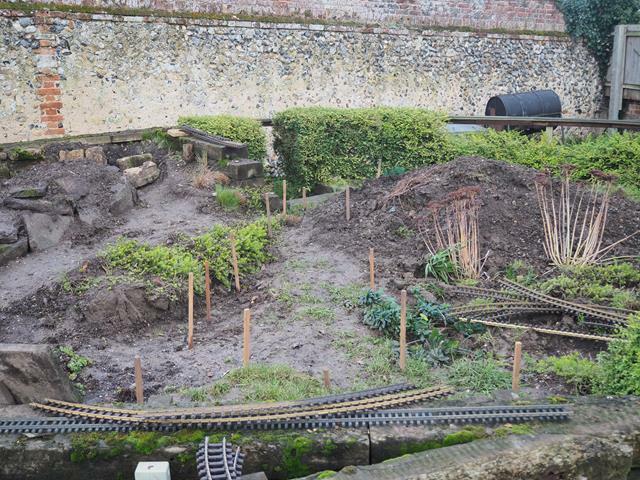 sorting put the access from the main line and into the sidings on the left which were going to be extended. the track roughed out. I was using some old R2 curves to set a minimum radius, though the final track would be flexi. with a drop of 50 cm I was going to need to travel about 13m to maintain the 1:25 gradient by the time I got to the bottom of the slope, where I was originally planning to simply join a double circuit round the tree stump area on the level...…..but it did not quite workout like that. and then lots of digging. You can see the pile of spoil on the right of the picture. Fortunately I had a few spare as I was extending the paved are a bit. 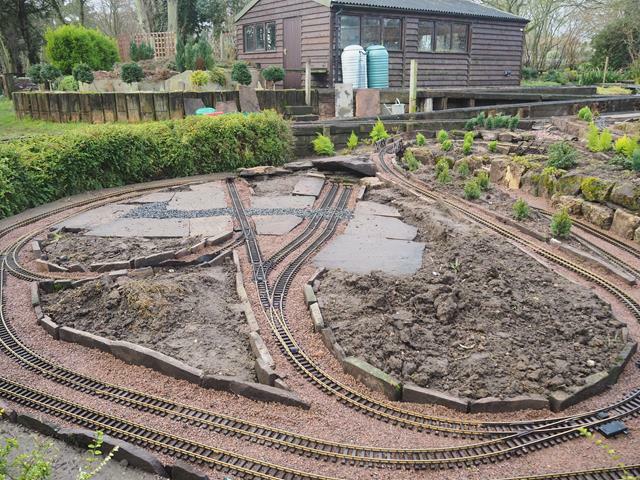 most of the slabs now laid, it was possible to sort out the level of the sidings and thus the gradients. Removal of the rockey also provided the "mountain" round which the first descending curve would run. 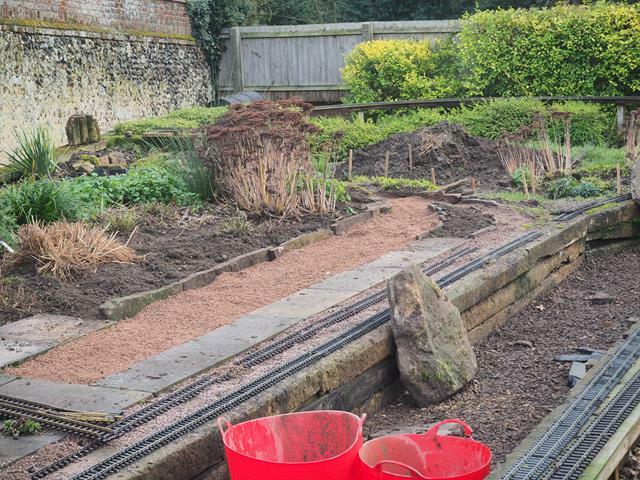 Having carefully dug away all the soil to create the curve in the foreground I began, much too late to think about how this line would join the envisaged double circuit at the bottom of the slope and how this might work operationally. 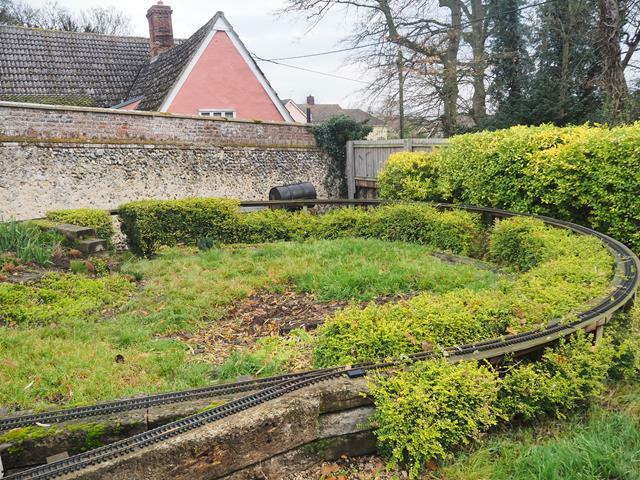 If it joined the outer circuit it would have to move to the inner one to reach any sidings, and if there was a simple crossover then it would be impossible to have a train running round the outer circuit all the time without there being inevitable crashes. No the line down the hill needed to join the inner circuit and run into the sidings while a train could be set running round the outer one without needing to be under direct control all the time. This meant that the descending line would have to cross over the top of the circuits at the bottom before joining them, and that meant a bridge. I was also beginning to think about access. 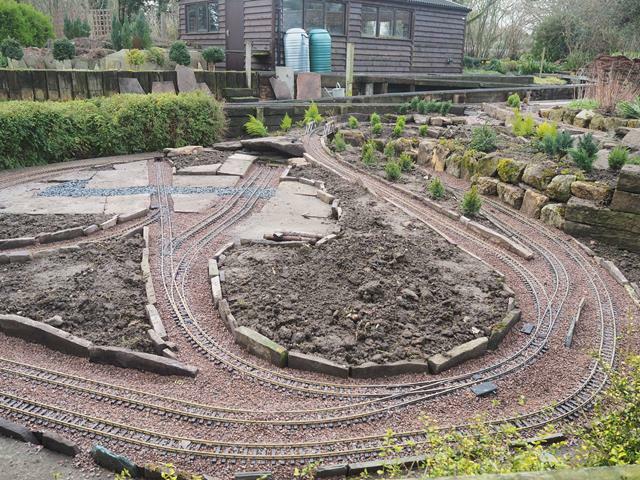 All track and beds makes this difficult. Back to the drawing board. You know it is sometimes best to have thought all this through before you start. I had only been working on this idea for about 4 years. Interesting wall in the back ground..could you tell use about it ? we live in a house built in the 1960's by my wife's grandfather. It was built in the garden of a much bigger house (now our next door neighbour) which was lived in by her family since 1920. 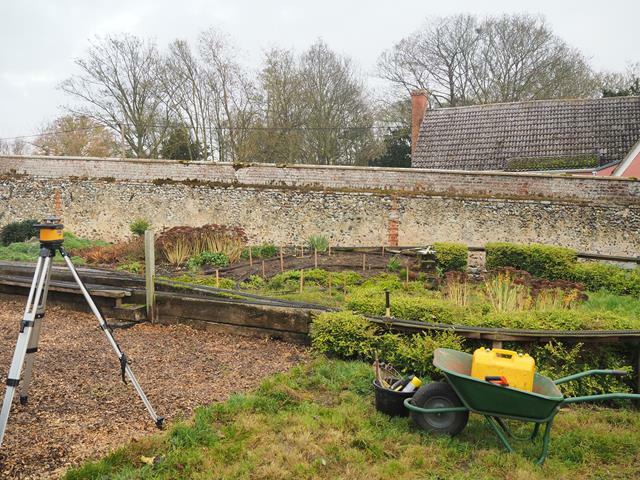 A significant part of the bit of the garden that her grandparents took to build the house was the old walled kitchen garden of the bigger house. 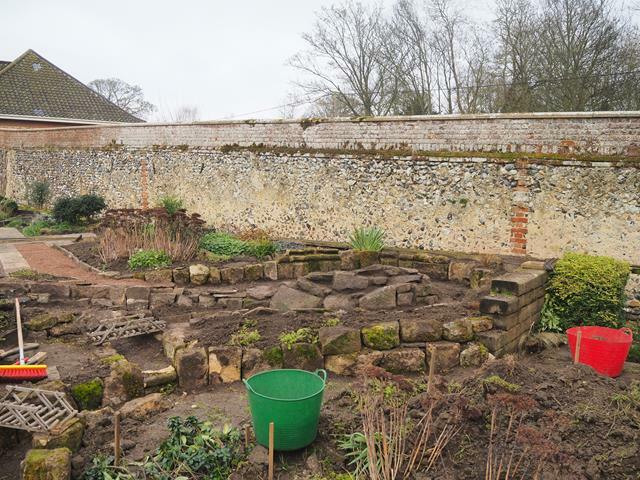 Many kitchen gardens have high walls round them and much of our boundary is formed by a brick and flint wall. 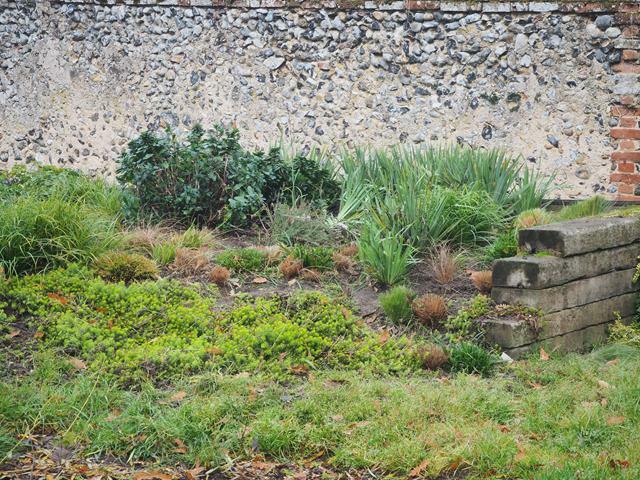 In our part of the UK flint was a common building material hence the brick and flint wall. 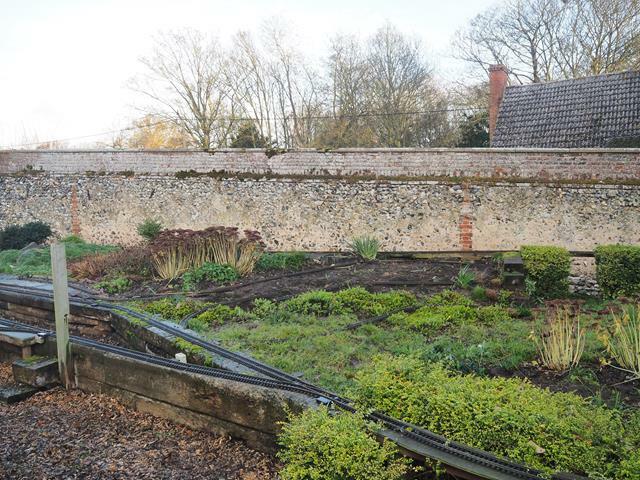 It is at least 200 years old and may well be much older as we live in a village with many old buildings one of which features in the doomsday book! Reactions: mike, railwayman198 and Sean. Great looking RR in the works! I look forward to future installments. I too have severe "shed envy" like most of the others have remarked. 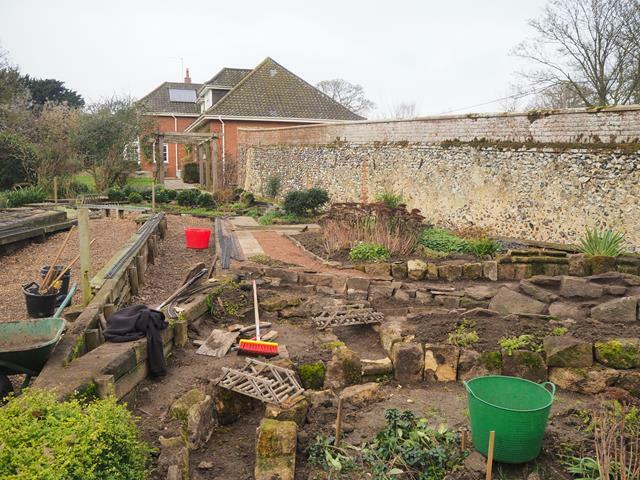 Using the larger stones as a retaining wall I built the next layer down the slope and the edge of the lower circuit (partly obscured by the green tub). 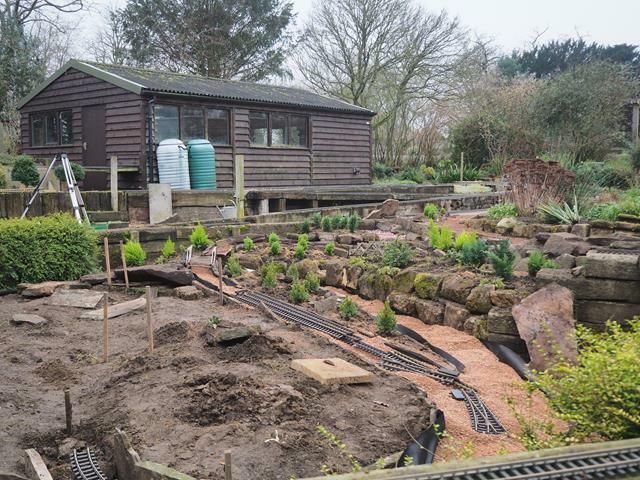 I decided to create a dry stream bed which I could use for access and to give some reason for the track to level off and because I had the bridge from a previous layout. the bridge on the left is the one crossing the lower circuit where you can just see the tops of the stones that create the deep cutting it runs though. 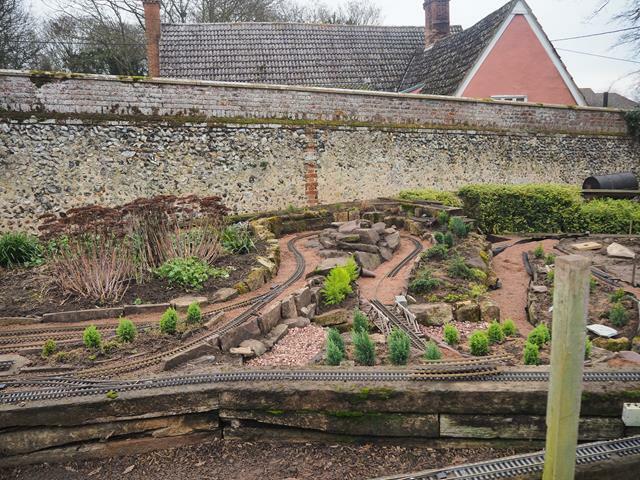 By far the most complex bit of track laying was going to be where the inner circuit and the descending branch line met at an R3 point and almost immediately beyond it there would be another point to the sidings. I felt that there was no point in having two complete circuits. 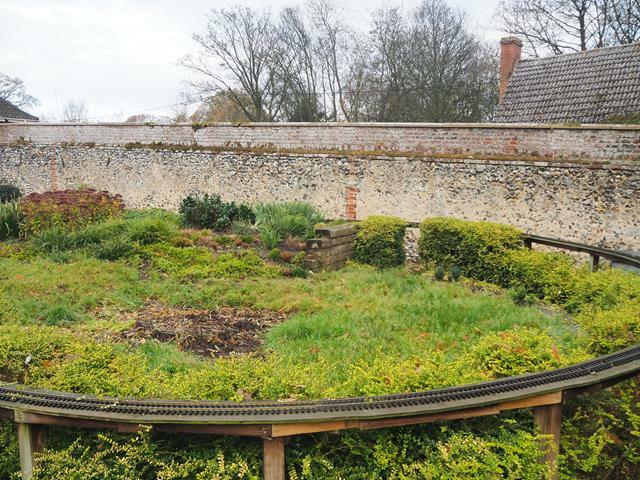 the track passing under the bridge could be single which meant I could use the bridge I already had, movement on the inner circuit would be from up and down the branch line, a reverse loop to turn the locos and enough room to act as a head shunt when needed. All this could be done while allowing continuous running on the outer line. The only down side would not be being able to run two trains in opposite directions on the circuits but that would not be very prototypical on the average logging line anyway! 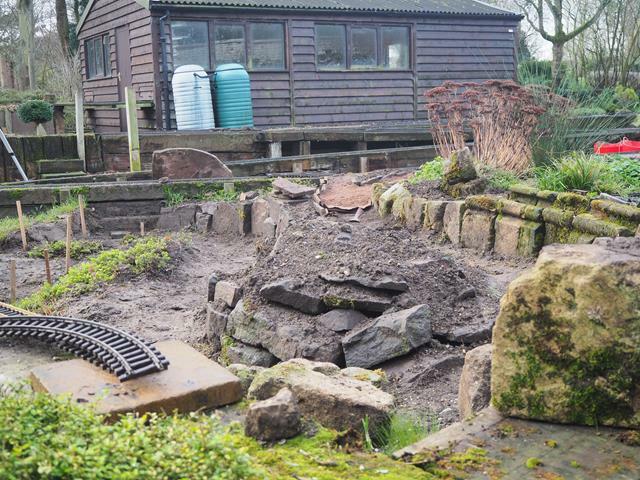 After consideration I found that a large bit of rock fitted quite nicely into the corner between the bridge and down ramp I had created so made a further small rockery here. 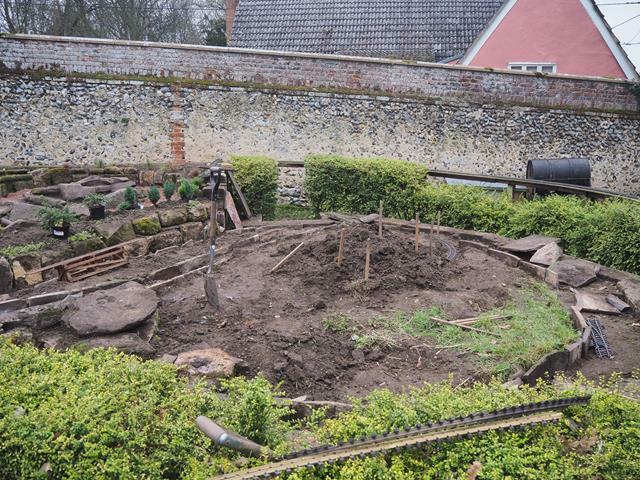 You can see this just to the left of the spade stuck in the soil. 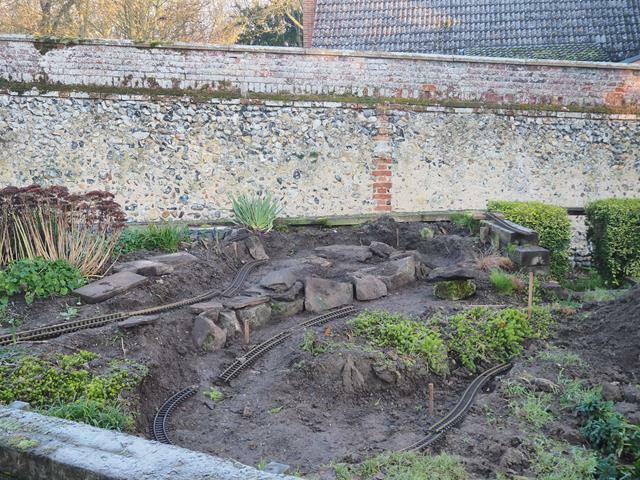 I also started putting the retaining wall (broken paving on edge) to make the circuit. 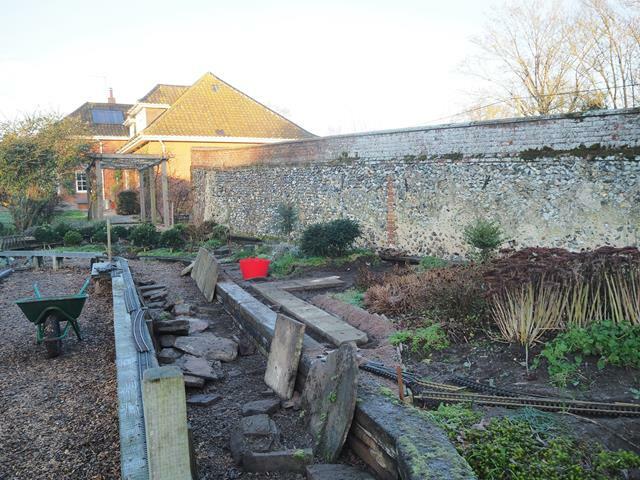 This whole area was leveled off several years before by a sleeper retaining wall which you just see in places. 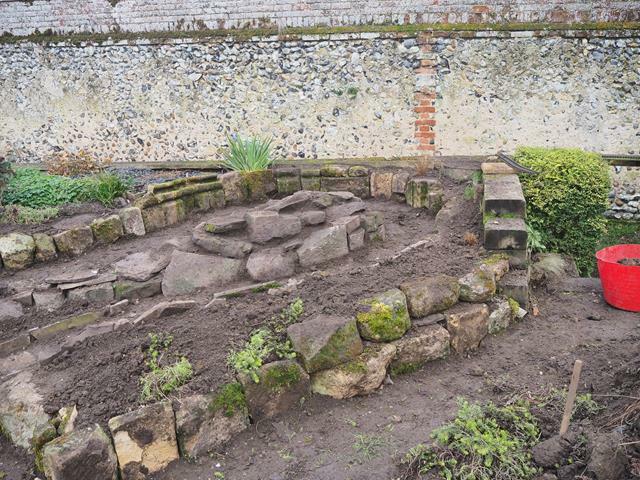 This formed the outer retaining wall of the bottom circuit for 3/4 of its circumference. Hopefully these will get a lot bigger in the next couple of years. I know from experience that the fir trees (Xmas trees) though miniature can get very big so they are still in pots to limit their growth a bit. 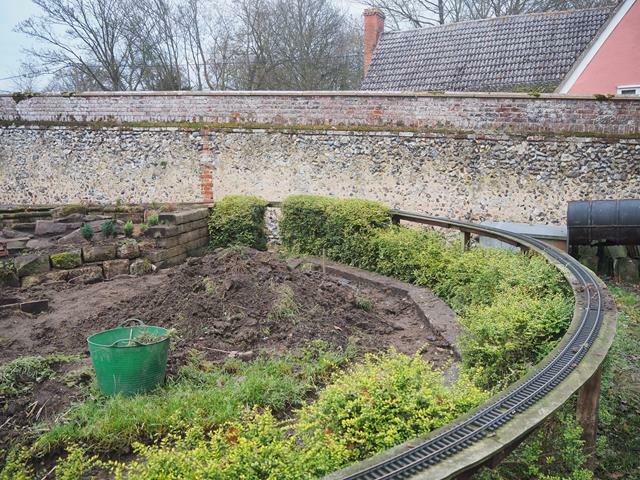 Now track can start snaking down the slope. This is all flexitrack from my auction bargain bundle. I invested in a rail bender years ago. It only bends one rail at a time which means dissembling and assembling track, but the double rail versions cost arm and a leg. 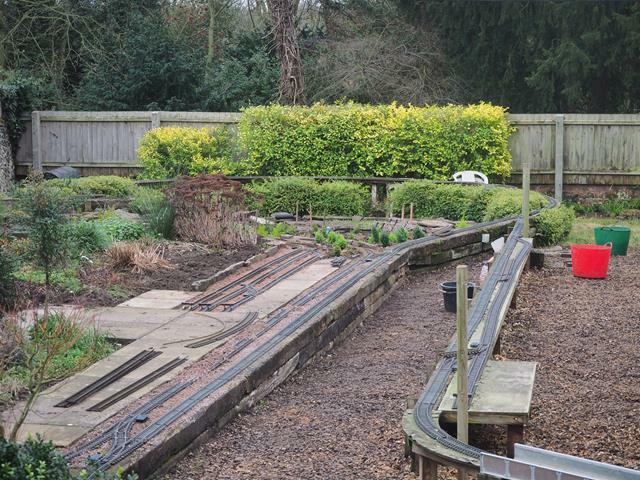 Track now reaches all the way to the bottom and has linked up with the inner circuit. While her you can see where the there is the single section of track on the bottom circuit where it runs under the bridge. The rest will be double. 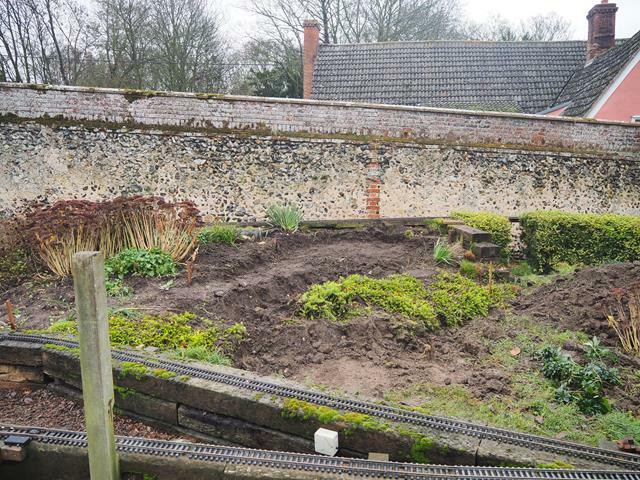 Need to sort out the exact position of the inner part as it has to have a point off it not only for the sidings but also the turning Y so it is a case of lay a short section of ballast and track, sort the geometry, put in the retaining stones (for the ballast) and lay a bit more. 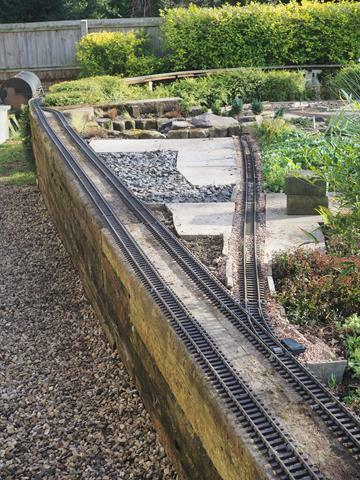 if you try and do all the stones and then the ballast and then the track (as you can for a long strait run with no linkages) you end up making mistakes and having to move it all. Personal question : how has the body been handling all that work .... Mine hurts just reading this.. Very nice! 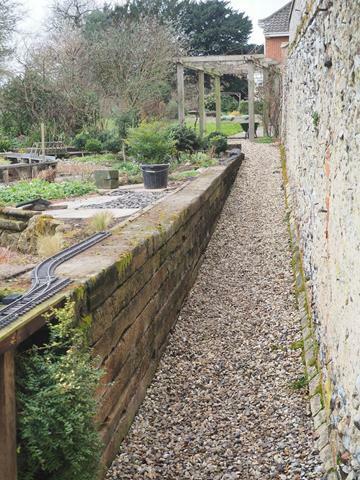 I also use 1 to 1 scale sleepers for retaining walls. Those thing are heavy! I like your long straight sections and wide bends. I have one of those Pola coaling towers. Apparently there where only about 2000 made? I also have two Playmobile engines for visiting children. They don't want to go home once they get their hands on them. 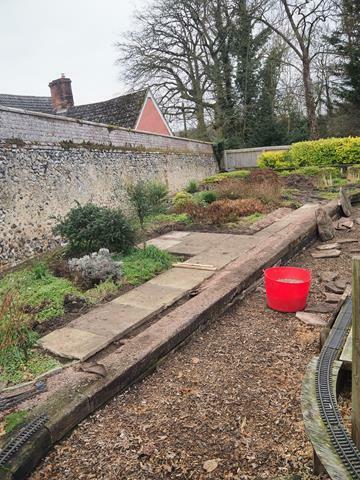 The body has been fine apart from a bit of back ache when moving all the heaviest rocks and paving slabs. Knee pads fitted into pockets in the front of my working trousers have been a great find. This sort of thing keep me fit. I am surprised there were only 2000 coaling towers made. I have seen them on eBay from time to time and mine did not come with any suggestion of this when I bocught the kit. I know pola sometimes made a model and then produced it in a special limited edition with minor modifications. My pola turntable is one such, and I know they did this with a fancy motorised version of both the water mill and the sawmill kit. I agree that playmobile for the young is fantastic. That and Lego were great favourites with my kids and my little granddaughter is already demonstrating that she is a chip off the old block. I have chipped up three old playmobile locos so they can run on DCC and have. A couple of radio controlled battery ones too. Only problem is the batteries don’t last long on such a long circuit and don’t do well on significant gradients. Wonderful layout, and amazing story over several years of evolution. I love these type of long term projects (slow and sure). I'm doing the same thing with my GR build, now two years into construction. just had to finish shorting out the area at the bottom of the slope. 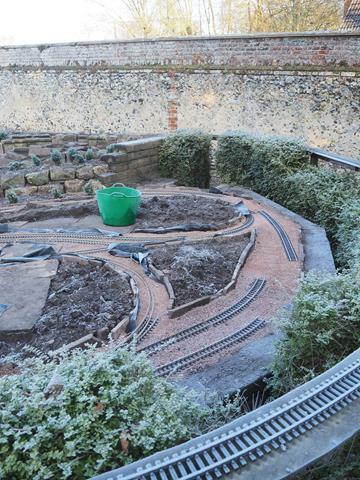 This went pretty quickly though as you can see from the photos, some days were on the chilly side and tracklaying in subzero temperatures is not good as the track the ballast and my fingers all go solid. 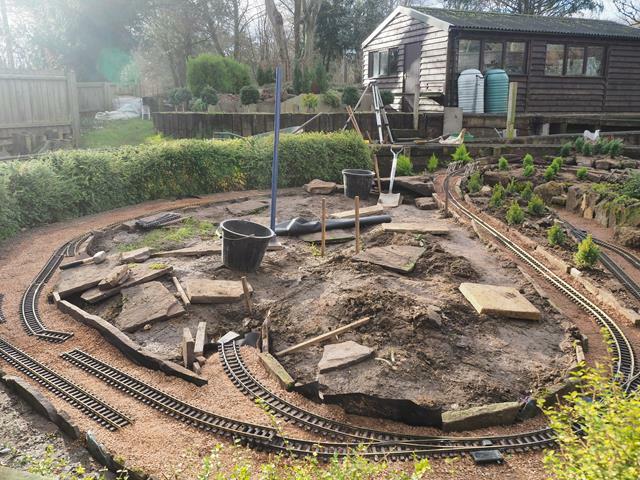 Still have to complete the two circuits and the turning Y, which is inevitably given the geometry going to have some fairly tight radius track. A couple of wet and cold weeks later and it is all done. 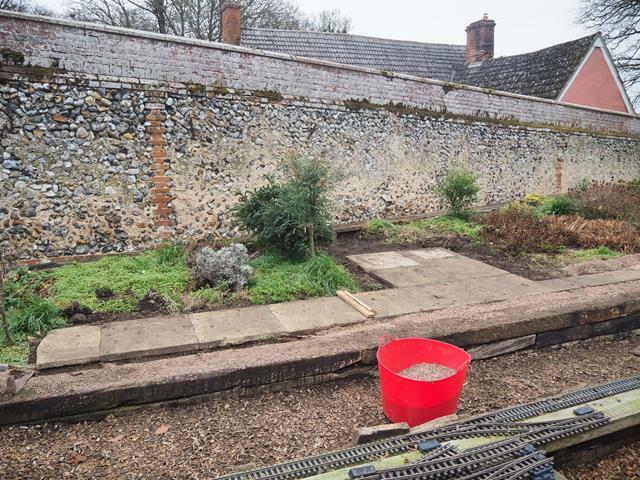 The sidings are in, all the paving for the buildings has been laid, though these will not go out till it gets warmer, saw mill on the right, and a small town and station in the centre and on the left. 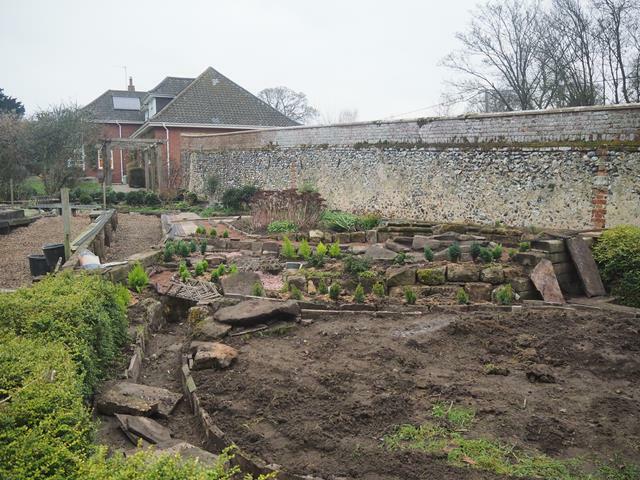 Need to give the beds some thought, some will be trees but they will also need some ground cover. 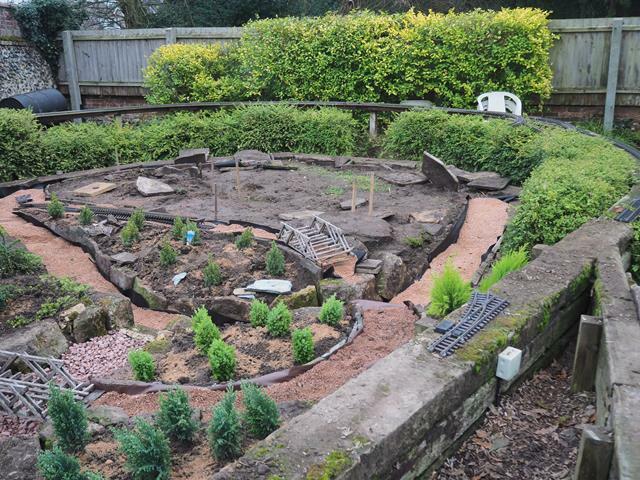 A friend want and Indian encampment which I think wounds like a good idea, just need to find the tee pees and Indians. 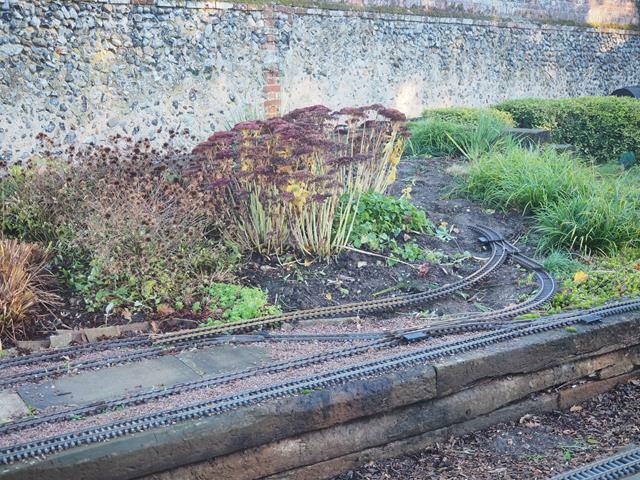 At last a decent image of the points arrangement at the bottom of the branch line. It is intended that all the shunting and manoeuvring can be done n the inner circuit leaving the outer free for something to round to keep things moving. I am one of those people ho gets very cross when I see a big layout at an exhibitions with nothing happening on it. I firmly believe that visitors come to see trains moving about as well as admire the scenery. This shows the completed turning Y. Now all that is needed is the return loop box and to wire it. Unfortunately although I have 2 boxes they are both in use at the moment and wont become free till I have completed my next project. I am far too stingy to buy one just to fill in the few month gap, so no use of the Y for now. 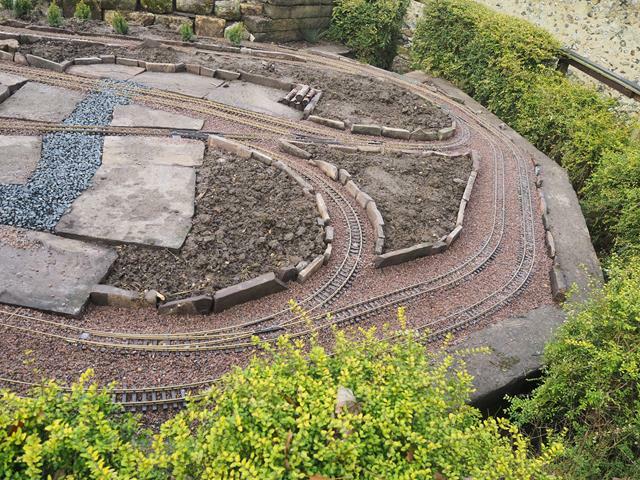 More details of the Brewery area, siding now in place and track back down on the main line. 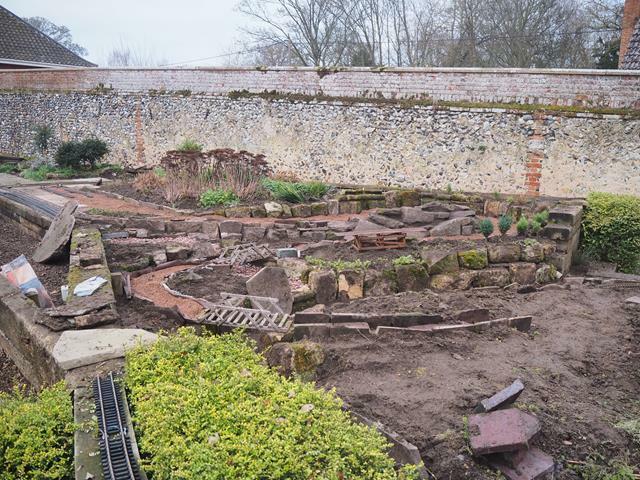 You can see a few piles of cut up thermalite blocks around the layout. These are cut to just fit inside the larger buildings. I had problems with these being blown over and damaged, all completely cured by placing them over the blocks that then prevent them from toppling. And the same area seen from the other direction. Now all that is needed is the rewiring and some test runs but that will have to wait for the weather to warm up a bit. I have also got a few models to make, just taken delivery of a Ferris wheel for the fun fair area looks like about 400 parts so that will take a while to put together. 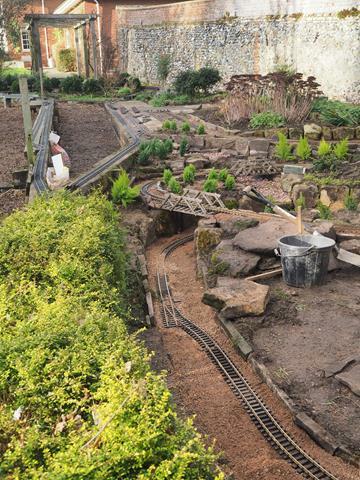 Your railway is shaping up nicely ! Looking forward to seeing some videos of trains running. I think the 'adverse camber' is the inner rail is too long?? - no-where for it to go, but up.. Very nice build, looks like you have been motivated to work through the Winter just like I was when I started thencurtent Dunnybahn. For Cold Days I was wearing a Lidl Thermal WorkSuit kept me well warm on the coldest days in 2013/14. But unlike you I had a neat all wet Spring 2013 to contend with which put back work no end. Still I persevered as I could. Noting that you are short of Boxes, I still have 2 on my For Sale Pages if they are of any use.